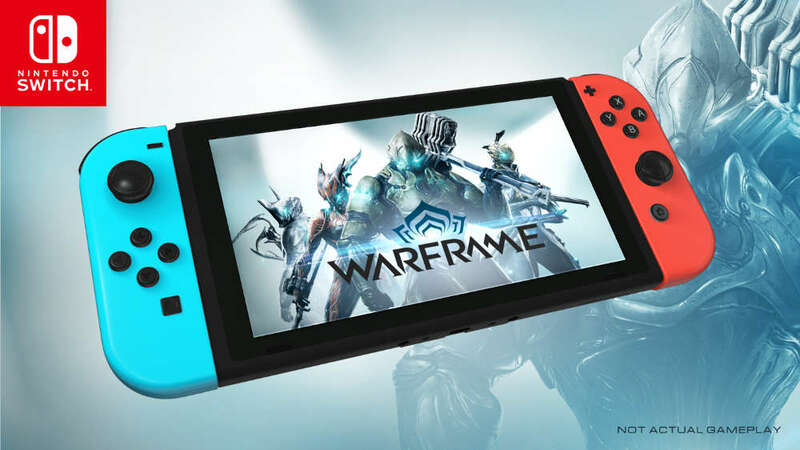 Canadian developer and publisher Digital Extremes is excited to announce its hit cooperative online action game Warframe® will be available for digital download on Nintendo Switch™ Tuesday, November 20, 2018. Having amassed 38 million registered users over its five-year growth cycle on multiple systems, Digital Extremes’ AAA free-to-play game offers Nintendo Switch players an unparalleled blend of fast, fluid combat, deep RPG and customization systems, and a constantly evolving stream of updates, all couched in an imaginative science fiction setting. In collaboration with developer Panic Button (Doom, Wolfenstein: The New Colossus, Rocket League), Warframe‘s cooperative 1-4 player gameplay will give players a totally new opportunity to play with friends online in the role of a space ninja to explore the Origin System for FREE. In Warframe you will master the Warframe armor as the enigmatic Tenno, a race of ancient warriors wielding blade and gun, who are awakened from centuries of cryo-sleep by a mysterious guide, the Lotus, to restore order throughout the Solar System. Tenno will experiment with Warframe‘s blisteringly fast Parkour movement system, giving them the ability to Wall-Dash up walls, Bullet Jump across vast terrain and Dive-Kick into a teeming crowd of Grineer, among other moves. Eager Tenno will lose countless hours acquiring a variety of Warframes (36 and counting) to best suit their play style, as well as new weapons and gear, crafting specialized weapons and customizing their Warframe, weapons, ships and looks to make the ultimate Fashion Frame statement! Founded in 1993 by James Schmalz, Digital Extremes ranks as one of the world’s top independent video game development studios. Originating with the co-creation of Epic Games’ multi-million unit selling Unreal® franchise including Unreal, Unreal Tournament – and all its iterations – Digital Extremes went on to develop Dark Sector®, BioShock® for the PlayStation®3, the BioShock 2 multiplayer campaign, and The Darkness® II. The studio has reached its greatest critical and commercial success with the free-to-play action game, Warframe®, boasting a global community of more than 38 million registered players on PC, PS4™ and Xbox One. For more information about Digital Extremes, visit www.digitalextremes.com. To sign up for Warframe, visit www.warframe.com. Founded in 2007 by experienced game developers, Panic Button “Makes Good Games with Good People,” specializing in challenging co-development, original intellectual property, creation of developer tools, and digital publishing. Notable projects include Wolfenstein II: The New Colossus, DOOM, and ASTRO DUEL DELUXE for Nintendo Switch™, Rocket League for Nintendo Switch, Xbox One,and PlayStation®4, TO THE TOP for PlayStation VR, and the multiplatform Disney Infinity franchise. More information can be found at www.panicbuttongames.com. The worldwide pioneer in the creation of interactive entertainment, Nintendo Co., Ltd., of Kyoto, Japan, manufactures and markets hardware and software for its Nintendo Switch™ system and the Nintendo 3DS™ family of portable systems. Since 1983, when it launched the Nintendo Entertainment System™, Nintendo has sold more than 4.6 billion video games and more than 725 million hardware units globally, including Nintendo Switch and the Nintendo 3DS family of systems, as well as the Game Boy™, Game Boy Advance, Nintendo DS™ family of systems, Super NES™, Nintendo 64™, Nintendo GameCube™, Wii™ and Wii U™ systems. It has also created industry icons that have become well-known, household names, such as Mario, Donkey Kong, Metroid, Zelda and Pokémon. A wholly owned subsidiary, Nintendo of America Inc., based in Redmond, Wash., serves as headquarters for Nintendo’s operations in the Americas. For more information about Nintendo, please visit the company’s website at https://www.nintendo.com.